If New Year’s Eve plays out as planned, I will either be at home alone or with friends, or with other friends at their houses. I will have spent Christmas Eve and Christmas Day with my family in Massachusetts. Often I fly off to California the that day or the day after, but because my LA daughter and her husband will be in Arizona for two or three days, and because I have to be back for meetings on Jan. 2, I will have the week between the holidays at home. And I will be cooking. I do love to bake, but, very honestly, if I don’t have to make anything sweet for the next month or so, I will be so happy. For New Year’s Eve, I have decided to make a couple of dips. I loved the one I tasted that Gretchen Newsome, who is on board of education with me, took to a party three weeks ago. There was a lot of really good food at that get-together, but most of us decided that this artichoke dip was so delicious that we would rather eat it by the tablespoon than daintily dip pieces of bread into it. The second dip I have made a few times. I love the flavor of anchovy but don’t like to touch them. With this recipe, though, I will touch the little devils. Butter a Pyrex pan or gratin dish. Sauté the onions and garlic in butter on medium low until translucent. Do now brown. Add chopped artichokes and continue to cook until warmed through. Pour cooked mixture into a large bowl. Add cream cheese, cheddar cheese and sour cream. Mix well. (I use my food processor and pulsed around five times.) 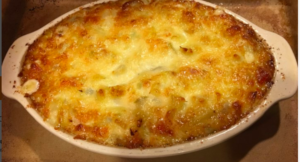 Place mixture into gratin pan or heat-proof glass pan and bake until bubbling. Combine all the ingredient into a blender or the bowl of a food processor and puree until smooth. Pour into a bowl and serve with fresh vegetables and small chunks of good bread.